Tiny Israel as Jehoahaz ascends throne. Map by Scott Richardson. He restored the border of Israel from Lebo Hamath in the north to the sea of the Arabah in the south, in accordance with the word of the LORD God of Israel announced through his servant Jonah son of Amittai, the prophet from Gath Hepher (NET). 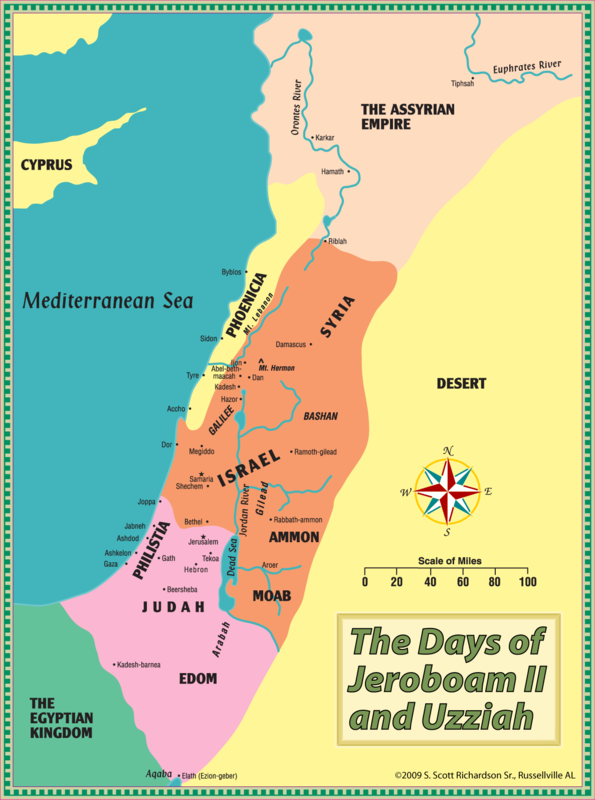 Israel during Jeroboam II. Map by Scott Richardson. 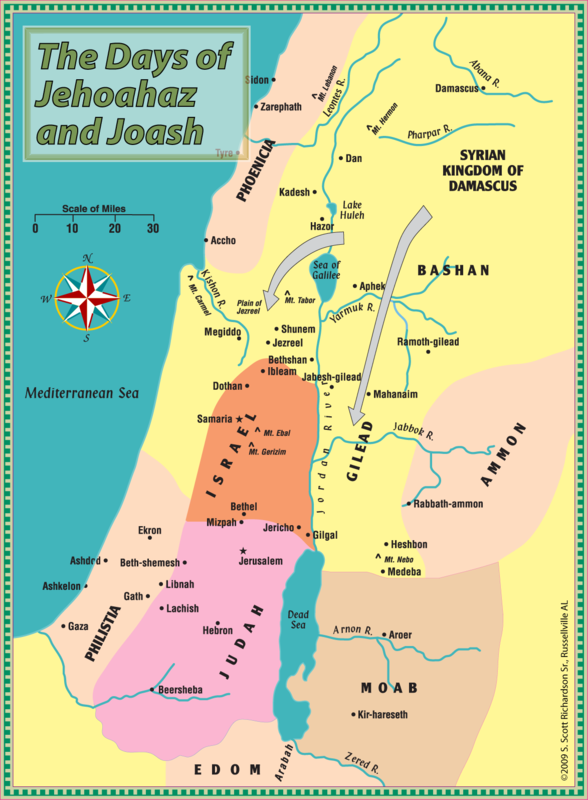 Note that this restoration of Israel’s territory was foretold by Jonah the prophet. We usually think of Jonah in regard to his reluctant mission to Nineveh, as seen in the book of Jonah. But we learn from the 2 Kings 14:25 reference that God also used the prophet to address the situation with His people Israel. 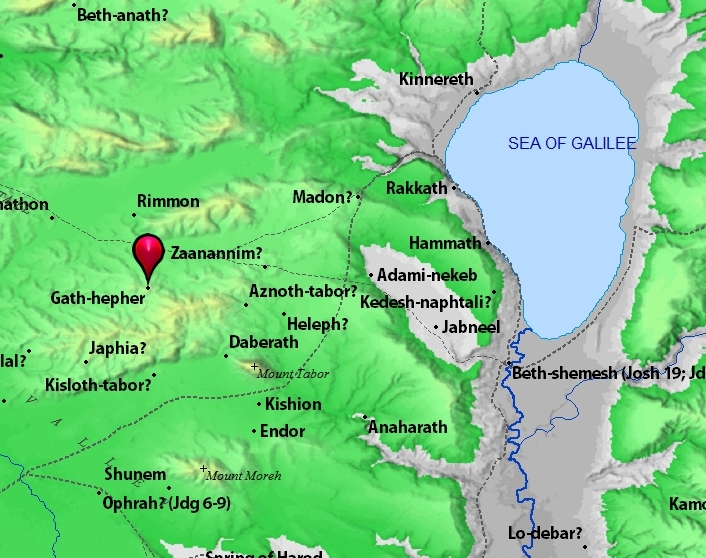 Jonah was from Gath hepher, which was in the Galilee. Gath hepher. Map by BibleAtlas.org. I recently had opportunity to visit Jonah’s hometown. Gath hepher. Home of the prophet Jonah. Photo by Leon Mauldin. Our Visualized Survey of the Bible is going well here at Pasadena. It is good to be with Dee & Norma Bowman, and all the folks here. 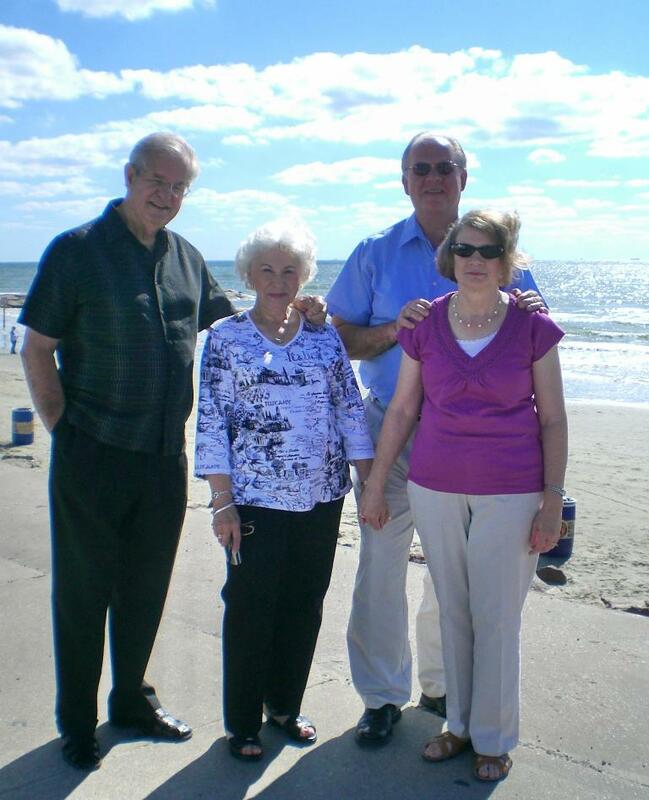 Dee & Norma Bowman, and Leon & Linda Mauldin at Galveston, TX. 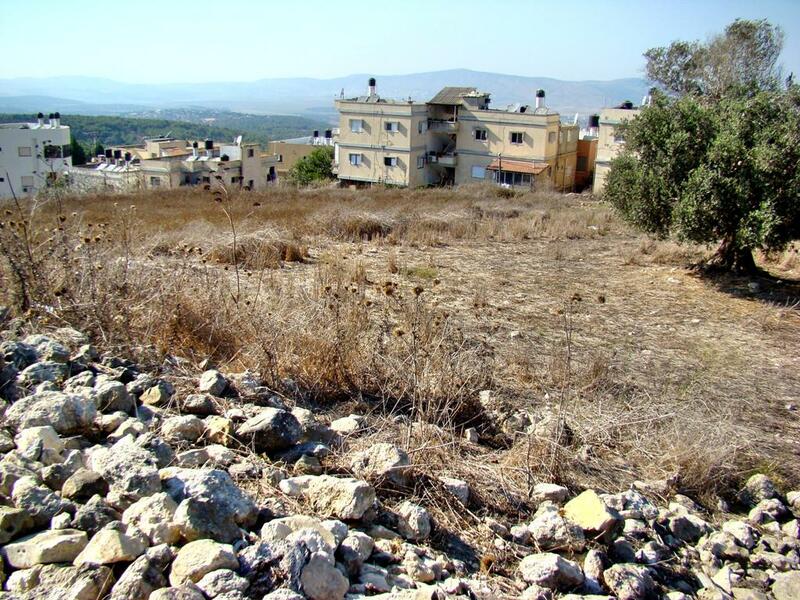 Recent posts have featured Shiloh as the site of the Tabernacle, and then Kiriath-jearim as the location of the Ark of the Covenant after the Philistines destroyed Shiloh. When King David captured Jerusalem he prepared a tent for the ark and had it transported there, carried by the Levites (1 Chron. 15:1). The biblical record continues, “So they brought the ark of God, and set it in the midst of the tabernacle that David had erected for it. Then they offered burnt offerings and peace offerings before God” (16:1). Again, that was in Jerusalem. It was a time of great rejoicing. So he [David] left Asaph and his brothers there [at Jerusalem, LM] before the ark of the covenant of the LORD to minister before the ark regularly, as every day’s work required; 38 and Obed-Edom with his sixty-eight brethren, including Obed-Edom the son of Jeduthun, and Hosah, to be gatekeepers; 39 and Zadok the priest and his brethren the priests, before the tabernacle of the LORD at the high place that was at Gibeon, 40 to offer burnt offerings to the LORD on the altar of burnt offering regularly morning and evening, and to do according to all that is written in the Law of the LORD which He commanded Israel” (1 Chron. 16:37-40). Later when David ill-advisedly took the census of Israel it was again noted, “For the tabernacle of the LORD and the altar of the burnt offering, which Moses had made in the wilderness, were at that time at the high place in Gibeon” (21:29). When David died, and was succeeded by his son Solomon, it would be at Gibeon where YHVH would appear to him, the point being significantly included that Gibeon was the site of the tabernacle and altar (2 Chron. 1:1-12). We were able last month to see Gibeon, El Jib. 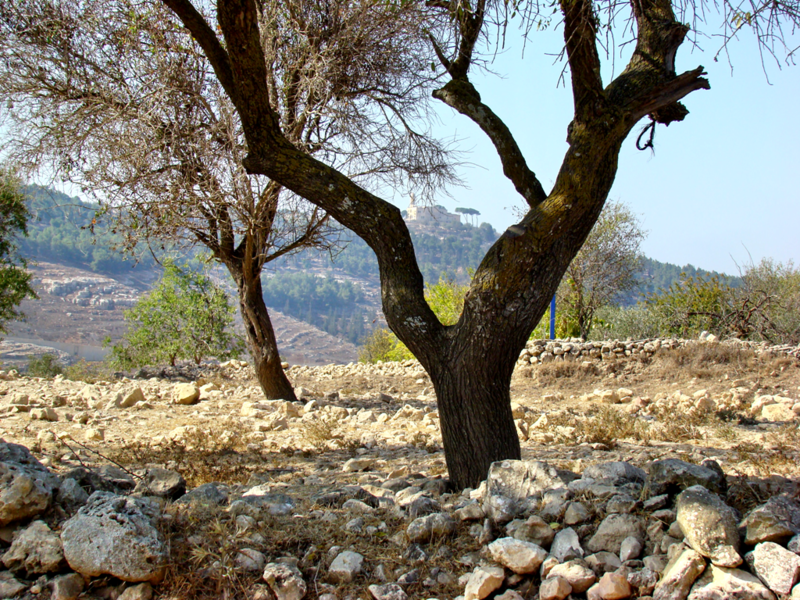 Biblical Gibeon, site of tabernacle in Davidic & early Solomonic reign. Photo by Leon Mauldin. Click image for high-resolution. In the distance you can see Nebi Samwil, named for the prophet Samuel. You are currently browsing the Leon's Message Board blog archives for October, 2011.